others and share your knowledge of dementia. One certificate will be sent to the original user's address. Who has pre-approved my course for Continuing Education Credits? When will my certificate of completion be issued? Certificates are issued immediately upon course completion. How can I learn more about preventing dementia and aging safely? 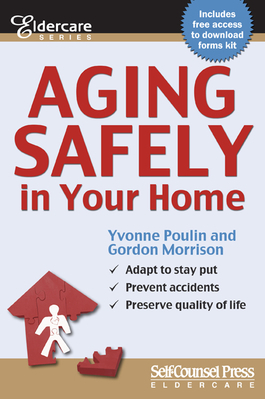 Check out our book Aging Safely in Your Home. Find out more about it by clicking on the Aging Safely tab on the home page of your course. Does Yvonne do live educational workshops and/or client events about dementia? How can I learn more about dementia and Alzheimer's disease? Please consult the local Alzheimer's Association in your country or area. They all have an incredible amount of information that gets updated regularly. Can I get a discount for any friends I refer? Yes. Your referral means a lot to me, and I'd like to reward you for promoting this course. I'll send your friend a 15% discount coupon when you forward their email address. To sweeten the deal if you've purchased a course yourself I'll give you 25% off any other online course available on this site. Does the guy in your scenario videos really have dementia? Haha. He says not yet! Gordon Morrison is my partner and co-author as well as my leading man in the work-place scenarios. Don't worry… he's just a great actor. Why am I skipping through lesson material? It's possible you're clicking the green NEXT button before you should be. Whenever there is a presentation that has more than 1 slide, just scroll up to the top toolbar above the slide and click on NEXT SLIDE to proceed. Why does it show that I have NOT completed 100% of my course? The system needs to confirm you've watched each presentation, taken each quiz, and looked at each PDF (download only suggested but not required). Return to the lessons that do not show a green checkbox marked as completed. Why can't I re-take my exam to get a higher grade? You can. You must complete the exam first, and then re-take it. An 80% grade is required to pass. My course has expired. What do I do now? Funny how time can run away like that! Most courses have a 30-day expiry. Contact me directly at the email below to ask for an extension. First one's free; the next one will have a modest administration charge. I've lost my completion certificate and/or my receipt. Can I get another one? Don't you hate it when that happens? Make sure you've looked in the same email address that you used to sign up to your course. Check all your various folders. If you still can't find what you're looking for, don't worry! Send me an email with the approximate date you signed up or graduated, and I'll re-issue a duplicate certificate or receipt.